Portfolio - Barton Laser Leveling, Inc. The well known 27,000 acre Boardman Tree Farm alongside I-84 changed hands and is being turned back into center-pivot irrigation and a new dairy. Seeing the opportunity to provide a service, we geared up and were awarded the task of clearing thousands of acres of trees and grinding stumps into the soil. ​We completed three different contracts at the new Umatilla County Fairgrounds and Event Center location. 1) The City of Hermiston - Along with water and sewer mainlines, we installed a 34' deep sewer lift station (shown in photo on right) and all of the controls to provide telemetry at the waste water treatment plant. 2) EOTEC - On the 70 acre site we provided mass excavation, site grading, underground utilities; built the access road and subgrade/rock placement for parking lots and concrete walkways; installed fire water lines and cleared way for the perimeter fence. 3) G2 Construction - We provided earthwork for the event center building. The scope also included tie-in to water and sewer lines. A beautiful addition to the growing town of Hermiston. The Holiday Inn Express is all new construction. Our scope of work included general site work and utilities including: building pad excavation and compaction, water main connection, dry well and storm water system, oil/water separator, fire water system, retaining wall excavation and landscape boulder placement. This project included multiple levies, water control structures, erosion control structures, as well as habitat restoration for migratory birds. By partnering with local land owners and Ducks Unlimited, Barton Laser Leveling, Inc. was able to give back to the community by protecting a local resource. In addition, BLL was the first contractor in the Northwest to utilize GPS equipment while working for Ducks Unlimited. BLL's precision equipment was used to relieve pressure on DU's resources and provide valuable as-built information to provide time and cost savings to the owners. Demolishing the old Good Shepherd Hospital was the first project of a $69.9m school bond passed by voters. The project was completed per the original timeline and on budget,even with the installation of 700 linear feet of 30 inch irrigation line being added to the scope of work. 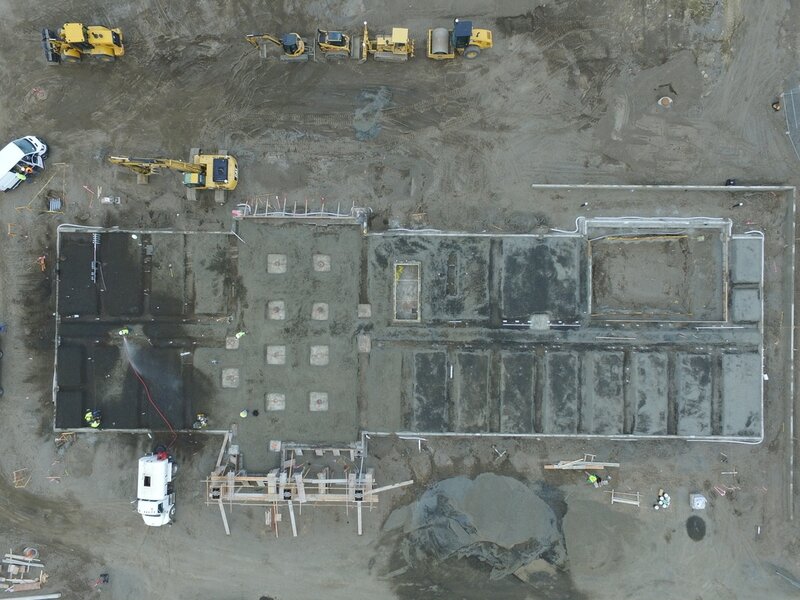 We have completed earthwork packages for a new elementary school (Desert View) and middle school (Armand Larive), and the new football field and track (Kennison Field) at Hermiston High School. Emergency exploration was completed over a 60 hour weekend period. With no prior notice, Barton Laser Leveling, Inc. mobilized to this job at 2PM on a Friday afternoon. Anderson Perry Engineering needed to check the structural integrity of the 100 year old drop structure at Cold Springs Reservoir prior to the scheduled arrival of ditch water at 10AM Monday morning. 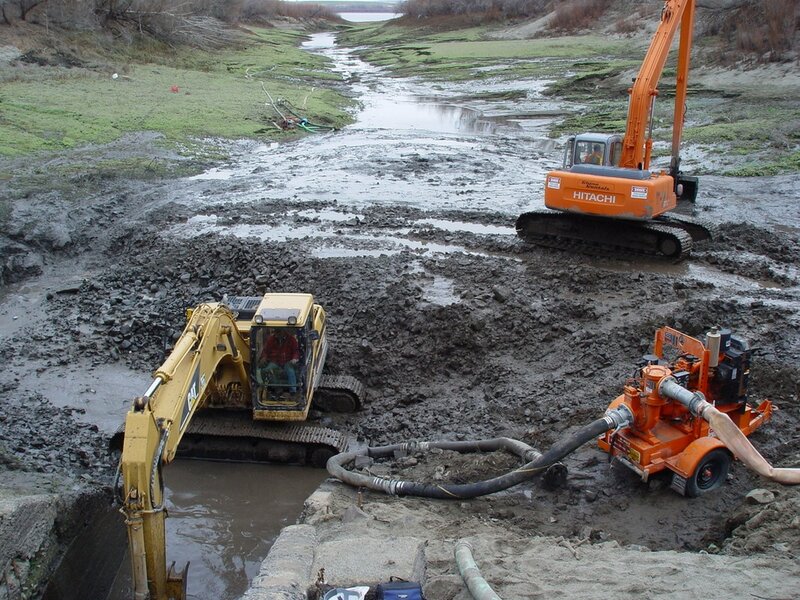 We moved and replaced over 2,000 cy of mud and debris, while building structures to stabilize machinery. A long-reach excavator was brought in from Seattle and the work was completed on schedule.